The unspoiled archipelagic islands that make up the paradise 450 kilometres off of Africa’s West coast are Cape Verde. In recent years, this idyllic land has become a travel mecca in the world of water sports. Wetsuits are abandoned here for good reason; average water temperatures sit firmly around a more than comfortable 24 degrees Celsius whilst air temperature is typically about 28 degrees. The islands are a magnet for windsurfing, kite surfing, diving and surfing with the season starting in September; what better time to visit the island. The locals call the islands ‘Sodade’ meaning the yearning to never leave – after experiencing Cape Verde’s water sports, most keen water lovers will probably understand what the locals mean. The un-crowded water sports playgrounds are mainly found on the flatter and less rocky islands of Sal and Boa Vista which welcome windsurfing, kite surfing, diving, paddle boarding, fishing, sailing and surfing into their temperate waters. Boa Vista, meaning ‘Good View’ in Portuguese is the eastern most island of Cape Verde. Famous for its sand dunes and beaches, it is less developed than Sal in terms of tourism. Yet Sal has retained its charm and is home to the best in wind surfing and kite surfing. Not only are these islands drenched in natural beauty; pure white sands and turquoise waters make up the serene beaches, plus consistent weather and incredible waves. Conditions are some of the best in the world, producing Mitu Monterio, a local kite surfer who won the 2008 Kite Surfing World Champion in the wave discipline. Josh Angulo, Hawaiian 2009 PWA Wave World Champion is a well-known promoter of the islands as a windsurfing destination, so much so, that he has made the islands his new home. The island perfect conditions also meant they were able to host the 2007 PWA (Professional Windsurfers Association) World Cup in February 2007. From September to April/ May is when the surf is at its peak, taking advantage of swells generated in the Atlantic that hit the bays in varying shapes and sizes. Beaches range from beginners to all surfers to professionals only. Most beaches are reachable by car. Santa Maria beach on the island of Sal is a great beach for beginners, with manageable point break waves from three feet to six feet. Few surfers are here and the sandy sea floor allows for little hazard. For the more experienced surfer eager for challenges, head to Ervatao on Boa Vista, renowned for its scenery and quietness, plus huge waves. From the town of Sal Rei hire a 4x4 to Ervatao; it isn’t easy to find so take a guide. The rocky reef churns out fast and powerful surf and long barrels from three to five feet going up to a massive 16 feet and over. However, watch out for urchins, rocks and at times bull and tiger sharks. Cape Verde’s natural island formation makes it a heaven for all levels or kite surfing and windsurfing. The most recent sensation to hit the waters is paddle boarding; standing atop a long board armed with a paddle allows riders to have a better view of oncoming waves. The south waters offer flatter and calmer waters perfect for the beginner windsurfer in Santa Maria on Sal, stretching out over four kilometres with a steep sand entry. Whilst over on the west coast at Ponta Preta, world class dominating waves mount up to eight foot and run onto a stony shore break proving superb waves for advanced riders or those looking for a challenge! Below the surface waves, Cape Verde still ticks all the boxes with a plethora of different level dive spots boasting colourful corals and marine life from the beautiful parrot fish to the graceful stingray, creating a perfect underwater world. The reef is so large that diving here will suit all levels of divers. The warm waters are a huge attraction where even at 30 metres (advanced level) wetsuits are still not needed. Dive sites range from caves to walls and wrecks. Choclassa is four kilometres from Sal with astonishing depths of 300 metres back up to 14 metres allowing for a variety of dives for beginners to experts. Here look out for moray, marlin, pelagic fish, mantas, stingray, lobsters, tuna fish, turtles, sharks and whale sharks. At Cavala a wall dive starts from 28 metres, descending to 65 where all types of pelagic fish are common. If you’d rather see the active life from above, then snorkelling still gives you the opportunity to find lots of sea life without breathing apparatus and the deeper depths. If you prefer to skim over the waves, try kite surfing. On Sal, kite-surfing is more suited to intermediate and the more experienced rider as conditions such as offshore winds are quite challenging. If you’re more of a beginner, fear not, aptly named Kite Beach is a great place to start with introductory waves that will set you up for the downwind conditions back at Santa Marina. Kite Beach is also the best all-rounder and is still an untouched natural area with waves between two and four feet. Ponta Preta boasts some of the best kite-surfing waves going, a mere 15 minutes from Santa Maria. The waves here are world renowned and can certainly rate as first class. Make sure however, you know what you’re doing here as there is no lifeguard. 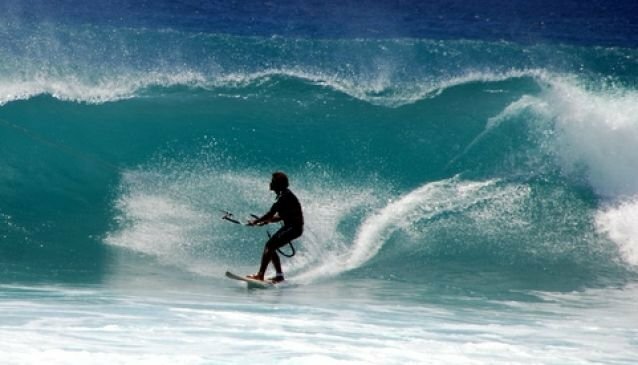 Weather you a massively keen water sports freak looking for top waves or a water lover looking for something new, Cape Verde can provide the perfect conditions from beginner to world class. Dive in and ride some waves before everyone else finds out the well kept secret.